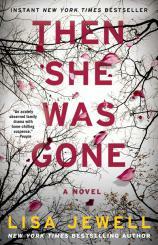 I read a fair amount of suspense fiction, so when, more than halfway through THEN SHE WAS GONE, I turned to my husband and said, “I still have no idea where this is going,” I knew that Lisa Jewell’s new psychological thriller was something unusual. In fact, her afterword/acknowledgments reveal that she herself didn’t know where her own novel was going, until a creative collaboration sent her in the direction that helps everything in the story make chilling sense…eventually. In her mid-50s, Laurel is not looking for a new relationship. Since her beautiful daughter Ellie disappeared a decade earlier, her life has been a process of withdrawing from the world. Now divorced from her husband, distant from her surviving adult children, living in a sterile apartment, and doing a variety of odd jobs (including cleaning her older daughter’s flat), Laurel has come to terms with a relatively solitary life. So when she’s approached by a good-looking man in a café, who bears more than a passing resemblance to her ex-husband, Laurel is flattered and charmed. "Jewell demonstrates once again that she has what it takes to genuinely shock, surprise and move her readers." Soon she’s involved in a whirlwind romance with this man, named Floyd. When she meets Floyd’s younger daughter, Poppy, who bears an eerie physical resemblance to her missing daughter, Laurel is momentarily taken aback. But Poppy’s affection and Floyd’s devotion soon convince her that their romance was somehow meant to be. Still, Laurel must quiet some voices of doubt, namely her son’s girlfriend, who insists that Floyd has a bad aura, and her own concern when a letter addressed to an acquaintance from her own past is delivered to Floyd’s home. The intricacies of the relationship between Laurel’s past and her present are revealed through careful pacing, as the present-day mystery is interspersed with sections from before Ellie’s disappearance and from several different points of view. Readers will feel compelled to pay attention right until the very end, and they’ll be rewarded with more than a few twists they might not see coming. In addition to being a complex and genuinely suspenseful narrative, THEN SHE WAS GONE is a rich study of the ways in which people respond to grief and how past trauma can continue to shape their decision-making and relationships years or decades later. Readers will be truly affected by Ellie’s real story once it’s revealed --- and they’ll be satisfied by the hopeful yet bittersweet ending. Jewell demonstrates once again that she has what it takes to genuinely shock, surprise and move her readers.